Earlier this week I talked a bit about black holes. In particular, one of the properties of a black hole known as the event horizon. The event horizon is the point of no return for matter entering a black hole. Once you cross the event horizon, you can never escape. Not even light can escape a black hole because of the warping of space at the event horizon. Of course this means that the mass of a black hole can only increase. Over time material crosses the event horizon, and in so doing forever adds its mass to that of the black hole. But that may not be how black holes work. The behavior of a black hole is determined by its intense gravity, and gravity is described by Einstein’s theory of relativity. In Einstein’s theory, gravity is a property of spatial curvature, and it’s curved space that causes matter and light to change direction as if there were a force of gravity. This is why the event horizon is a perfect trap. It’s behavior is built into the fabric of space itself. But Einstein’s theory is a generalization of Newtonian mechanics. In physics we say it is a “classical” theory. In classical physics objects have positions and motions that exist independent of any measurement made of them. The nature of matter and space are not affected by (passive) observation. There is, of course, another approach known as quantum theory. In quantum theory the nature of an object is not absolute. They way in which you measure a quantum system can directly affect the outcome. I’ve written a six-part series on quantum theory a while back (it starts here), but very roughly in quantum theory the nature of objects are somewhat fuzzy. For example, if you want to know where a particle is, you can only know approximately where it is, and the more precisely you determine its location the more uncertain you are about where it will be next. This contradiction between the two models is a large hole in our understanding of the universe. On the one hand, general relativity accurately describes the behavior of “large” things from baseballs to galaxies, but describes a universe of classical objects. On the other hand, quantum theory accurately describes the nature of atoms and molecules by recognizing the inherent “fuzziness” of reality. Often this contradiction can be overlooked. If you are looking at large massive objects, you can generally ignore quantum theory. If you are looking at atoms and molecules, you can ignore general relativity. But black holes are a bit of both. They are large and massive, but the matter that enters a black hole is trapped in an ever shrinking sphere, and according to general relativity is compressed into a volume smaller than the smallest quantum particle. It is therefore both very massive and very tiny. Ideally we would like to develop a theory unifying quantum theory and general relativity into a theory of quantum gravity. There are several approaches that have been studied, such as string theory and loop quantum gravity, but we don’t yet have a theory which is both mathematically consistent experimentally validated. But we can look at approximations that draw upon both the gravitational structure of general relativity and the material fuzziness of quantum theory. This leads to some interesting consequences. One of these consequences is that black holes cannot hold matter forever. Instead, black holes can leak mass in the form of light and particles through a process known as Hawking radiation. While Stephen Hawking’s clever bit of mathematics describing this effect is pretty straightforward, interpreting the mechanism is less clear. One way of looking at it is that the Heisenberg uncertainty principle (which gives quantum theory its fuzzy behavior) means that virtual quantum particles can briefly appear in the vacuum of space, then then quickly disappear. In the normal, everyday world, these particles average out to zero, so we never notice them. But near the event horizon of a black hole, some of these virtual particles could cross the event horizon before disappearing, which decreases the mass (energy) of the black hole and allows other virtual particles to become “real” and radiate energy away. Another view is that the inherent fuzziness of quantum particles means you can never be absolutely certain that it is inside the event horizon. 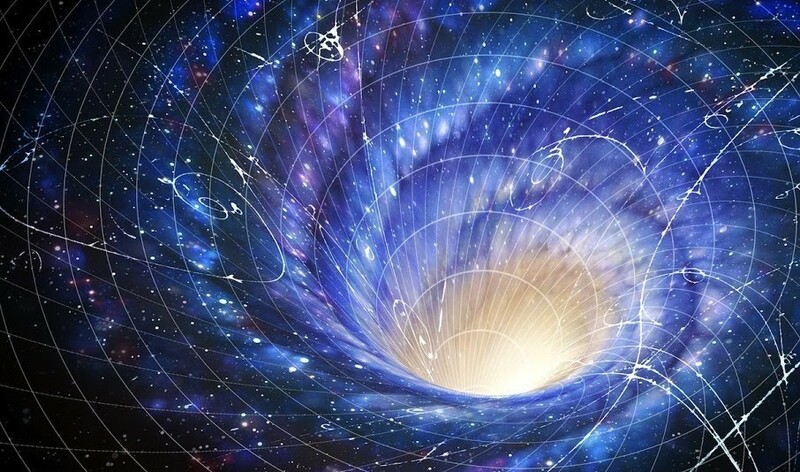 Although a particle cannot escape the black hole by crossing the event horizon, it could find itself outside the black hole through a kind of quantum tunneling. Although Hawking radiation has never been observed, it is generally thought to be a real effect. Of course we can’t be sure until we have a complete theory of quantum gravity. But if Hawking radiation is real, it has implications for the history and future of our universe. The amount of Hawking radiation increases as the mass of a black hole gets smaller. 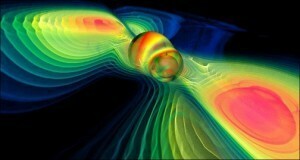 This means that tiny primordial black holes would radiate away and disappear in a burst of energy. Even supermassive black holes would eventually radiate away, and if the universe merely expands forever the last black holes will radiate the last light of the universe. And it would mean that even from a black hole particles can make a great escape. ADDING particles makes the hole LOSE mass? Does not sound right… Requires “negative mass,” how is that neat trick performed by the hole? The standard cop-out “gravitational energy is negative” is invalid (that negative sign is only a convention, and does not convert “regular” mass to “negative” mass). This is an example of where the conceptual visualization fails. Virtual particles are not real in the traditional sense. While we often describe Hawking radiation via virtual particles, it is actually the quantization of energy near the black hole that becomes the issue. Basically the energy is “fuzzy” and can leak out of the black hole due to quantum fluctuations. In normal flat space, virtual particles don’t have “negative” mass. I know I’m late to the dance here, but I was grazing your back articles, and this one about Hawking radiation reminded me that I’ve always thought that the quantum tunneling explanation has received short shrift. The inherent indeterminant location, or the “spread outedness” of a quantum particle does seem to permit some small fraction of them, photons for example, to transit the event horizon. Even if there are other mechanisms around a black hole that could also generate Hawking radiation, quantum tunneling should be possible. If the energy/frequency of the photons emitted from the black hole remains constant, and the diameter of the event horizon decreases in proportion to the mass, then it makes sense that the amount of Hawking radiation increases inversely to the mass of the black hole. While I’m not about to go up against Dr. Hawking’s interpretation, and reality – especially a quantum reality – is in no way obligated to behave so it makes sense to me, this quantum tunneling possibility has never received emphasis. You can look at it in terms of the “spread” of a quantum particle, particularly since the particle is more likely to find itself outside the black hole. The biggest problem with Hawking radiation is that it is semi-classical. That means it uses some aspects of quantum theory and some aspects of classical gravity. Since the two approaches have radically different assumptions, there is a bit of wiggle room in how it is interpreted. What we really need is a theory of quantum gravity, and that would be consistent.